Ferrari was quick in Mexico City as Ferrari driver Sebastian Vettel edged out Mercedes-man Lewis Hamilton in the Free Practice 2 session on Friday afternoon. It was mighty close to being Mercedes City, however, as Hamilton was a mere 0.004 of a second slower than Vettel. The dusty track had got progressively quicker in FP1, culminating in Hamilton using the medium compound Pirelli slicks to set the best time of the session at 1:20.914. Wehrlein and Grosjean were the first out on that track in FP2. Raikkonen set the early maker with a lap time of 1:22.075. Vettel used the medium tires to clock a 1:22.024. The drivers had a choice of Pirelli's medium, soft and super soft compound slicks. Ten minutes into the session, local hero Perez had a quick spin at Turn 5. A few minutes later, Hamilton, on the soft tires, took commanding lead of first place with a time in 1:20.362. It was slippery out there. Ericsson slid off and on the track at Turn 11, and Alonso at Turn 1. Rosberg moved into second place after setting a 1:21.416 on the medium tires 19 minutes into the session. Twenty-four minutes into FP2, Vettel began a run on the super softs, and he went into first place with a 1:19.790. Next, Raikkonen clocked a 1:20.259 on the super soft Pirellis. Hamilton, Kvyat, Rosberg and Sainz rounded out the top six one-third of the way through FP3. But most drivers had yet to try the super soft tires. And now the super soft runs began. Rosberg grabbed ahead of Verstappen and Ricciardo. Next it was Hamilton's turn on the super softs, and he went to second place with a 1:19.803. That was just 0.013 of a second slower than Vettel. Hamilton then lowered that gap to 0.004 of a second. With 40 minutes remaining, the order was: Vettel, Hamilton, Rosberg, Raikkonen, Ricciardo, Hulkenberg, Verstappen, Bottas, Sainz and Alonso. "Particularly strong pace from @HulkHulkenberg : 6th fastest using soft tyre @mexicogp #FP2 . Highest placed soft tyre runner," Pirelli tweeted. As usual, the latter part of FP2 was long-run territory. All 22 drivers were on track with 22 minutes to go, and so there was plenty of traffic out there. "They all want to race," Vettel radioed. "What an idiot!" He was talking about Alonso who was just in front of him. Raikkonen wasn't happy either: "I'd rather do the starts than drive around. We're learning nothing from this. If you want me to drive around I can, but it's absolutely f*** all use to me." 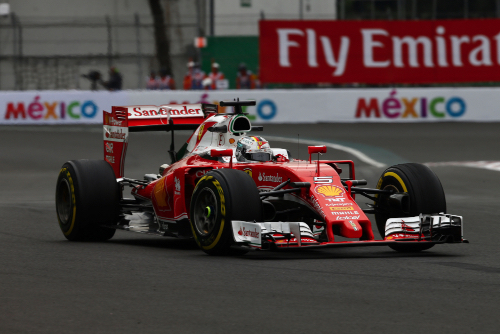 As the session wound down, the top 10 remained the same with Ferrari fastest in Mexico City.